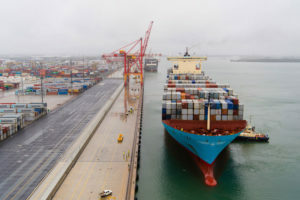 The Port of Brisbane joins the global major ports in the current trend of implementing blockchain-based solutions to connect supply chain participants, with the view to increase international trade efficiency. The new tool, called “Trade Community System” was developed in collaboration by PwC Australia, the Australian Chamber of Commerce and Industry (ACCI) and the Port of Brisbane, the port’s press service informs. The blockchain platform is designed to improve productivity and reduce costs and the complexity of international trade by eliminating human errors and duplication of data inputs through digitization, as all recorded information is shared in real time and in an encrypted form through a decentralized ledger rather than kept in files of individual companies involved in the supply chain. Australia’s trade volumes show positive growth. As we already wrote, in 2016 – 2017, the container throughput of the Australian ports grew by 3.7% to 7.2 mln TEU, the highest volume ever recorded, according to the Australian Competition and Consumer Commission. And this figure is projected by PwC to rise to 15 mln by 2025. Brisbane, Queensland’s largest multi-cargo port and Australia’s container port #3, handled 1.2 mln TEU last year, demonstrating the country’s largest growth in container traffic, +6.4%, thanks to growing Queensland’s imports and agricultural exports. The increasing volumes add pressure on supply chains, ports and border authorities. “At present the current inefficiency across Australian supply chains has added to the cost of doing business, creating up to USD 450 in excess costs per container,” says Bryan Clark, ACCI Director of Trade and International Affairs. “This doesn’t just represent in excess of USD 1 bln in value lost, but goes to the heart of Australian commodity trade viability when it gets priced out of the competitive global market.” He called for a major digital reform and modernization agenda for Australia’s trade industry.